What is FCI’s turnaround time? You should receive your FCI report within 48 hours. We normally respond to emails and queries within 48 hours. If dealing with certain enquiries is likely to take any longer, we will advise you. Why aren’t all results presented in the FCI reports? To ensure that FCI reports are kept clear and concise we only present relevant data. To view the datasets that have been checked there is a data list at the bottom of each section in the FCI report. The term ‘Contaminated Land’ is a legal definition, which is found in Part 2A of the Environmental Protection Act 1990. The presence of contamination by itself does not make a property ‘Contaminated Land’. The contamination present must be sufficiently severe to meet this legal definition through several tests and exclusions. My report has resulted in a ‘Further Action’. Does this mean my property is contaminated? No, ‘Further action’ does not necessarily mean that the Property is contaminated. ‘Further Action’ simply means that your report has identified a potential source of significant contamination at, or near, the property, which needs further assessment. My report has resulted in a ‘Further Action’. What do I do now? Review Service: If you have ordered an FCI Residential Report, you can take advantage of our free Report Review service, by submitting further information to the FCI Risk Team. The Risk Team will review this information with a view to the report result being changed to a ‘Pass’ (Please see guidance in your environmental report). Insurance: A Contaminated Land Insurance policy may be available. You should seek professional advice on the suitability of any policy, and understand exactly what it will cover you for. Alternatively, you may wish to proceed with your property purchase and undertake no further action. However, your solicitor is likely to advise against this, and if a lender is involved ‘doing nothing’ is often not an option. What information can I submit for the Free Review Service? All post 2007 NHBC Buildmark Certificates with policy references starting ‘AG’ and beyond are accepted by our free review service. NHBC Buildmark certificates dated pre-2007 must have contaminated land cover clearly shown as an endorsement on the policy documentation. Developments after 2001 are likely to have considered the possibility of land contamination. In some instances, the planners will have imposed conditions on the development to make the developer investigate and remediate contamination. If you have a copy of the original planning permission for the development of your property, and the accompanying discharge notices for the relevant conditions, these may be accepted by our free review service. The Local Authority Environmental Health Department is responsible for investigating and designating properties as ‘Contaminated Land’ under Part 2A of the Environmental Protection Act 1990. If the Local Authority can provide a clear written statement confirming that it has no intention to investigate the Property, this is likely to be sufficient to change the report result in our Free Review service. Where can I source Contaminated Land Insurance? A range of affordable policies may be available from CLS. For more information visit www.clsl.co.uk. I’m intending to develop my property. Will my report be suitable to submit with a Planning Application? No. Environmental search reports are designed principally to meet the needs of the conveyancing process. While they can be a good indicator of contamination issues, the Planners will require a slightly more advanced environmental assessment in the first instance that takes account of the fact that the land is going to be altered . If you are intending to redevelop, please contact us on 01732 755 180 or email info@futureclimateinfo.com so we can provide you with the right guidance to get your planning application on-track. Where can I find more information on landfills? However, if you wish to speak directly with the regulators then please refer to the ‘Useful Contacts’ section at the back of your report which has details for the Environment Agency and your Local Authority. Radon is a gas produced from the natural uranium in soils and rocks. What radon dataset do FCI use? We use the paid BGS dataset which is better than the free version available in some searches or available online, as it is higher resolution and the risk areas more closely relates to the source geology. Where can more info on Radon be found? From there you can also conduct your own radon tests. I am concerned about Radon, but I do not have enough time to carry out a test. A potential and lesser known option available to homebuyers is a Radon Bond, whereby an agreed amount of money can be put aside from the sale to pay for remedial works if determined necessary after the sale, allowing sufficient time for testing. What should I do if I have a further action for flood? If there is a ‘Further Action’ on flood we have arranged an affordable expert consultant ‘ Report Review’ service from our flood risk specialist partners JBA (Jeremy Benn Associates). The conclusion of this Review will detail the risk to the property and either reduce the risk of flood presented in the FCI report, or give next step guidance. If you would like to order a Report Review, this request will need to be placed by the professional advisor who ordered the report. 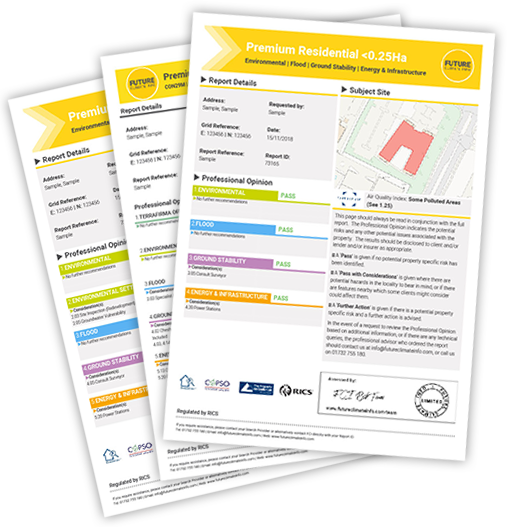 A Report Review can be purchased for £99 + VAT for properties under 10Ha in size. My property is in an area with geology that has a potential ground stability problem what should I do next? Though the geology may mean that a ground stability problem can occur there are other factors which may affect this, such as the water table. Consult a surveyor to make sure that there are no signs of subsidence in the property. Do FCI have the latest HS2 route? Yes, the route is reported up to 3km away. And we also state whether the property is in a safeguarded area/ compensation zone. How big is a PEDL licence? 10km Ordinance Survey national grid square areas were allocated.